Bike Race Cycling Vacation On Both Sides Of The Globe! What a 2018 for the English cycling world with all 3 Grand Tour Winners, the unpredictable Giro and 3 week champion Froome, the eventful Le Tour taken by Thomas and now the youthful Vuelta winner Yates. Brilliant bike racing excitement in different ways, Le Tour on the edge of Lake Annecy the highlight for Practice Bicycle. Can next weeks World Road Race Championships top off an incredible 2018 season for all fans of bike racing with an Aussie win? With 2019 just around the corner start the year in style with a bike race cycling vacation, we can’t wait to get started with all the professional stars in their new kit testing their legs at the Tour down Under & Volta ao Algarve. Set your goals and join us for all the action on your side of the globe in 2019! Looking to head to the sun this January, it doesn’t get any better than a bike race cycling vacation down under in Adelaide, South Australia. Australia may be a big country but don’t look any further than the Tour down Under this January for the best cycling in Oz, add action and atmosphere with the best cyclists in the world and it will be a week to remember, bring your best legs and sun screen and enjoy it with us! Can’t head as far south as Australia for your cycling vacation but still looking for sunny cycling to motivate the year it has to be February at the Volta ao Algarve, Portugal. It was the best location for Geraint Thomas to turn the legs early in the year, find out for yourself why? 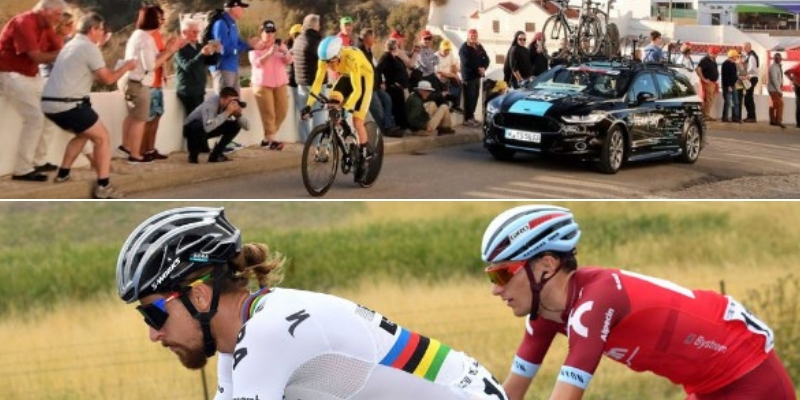 Ride the routes and get close to the race action with this 2019 opener to the International race season on the amazing secret cycling roads of the Algarve.